All praise is due to Allah and peace and salutations upon the Messenger Muhammad (S). For some time now people have been occupied with the question that, since the Imams (of various schools) have established everything from the sayings and practices of the Messenger of Allah (S), why are there differences of opinion among them? The numerous sessions of debates and the excessive number of publications on the issues of controversy have rendered the problem even more menacing. The issue has reached such dire proportions that those who object (to why the Imams have differed) have split into two groups. The first group is haplessly trapped in their evil thoughts of the Imams, so much so that even if they wish to disentangle themselves from this vicious web just out of good thought for the Imams, they are unable to free themselves from this trap because they are further ensnared by the apparent disparity between the sayings of the Imams and some of the clear source texts. The second group, on the other hand, has gone even further and, let alone the Imams, they have started harboring insolent thoughts about the Messenger of Allah (S) himself; simply because of the apparently contradictory hadiths transmitted from him. However, the fault lies in referring to (English or) Urdu translations of the hadiths, because in order to get a clear picture of the meaning, one has to posses the intellectual capacity to comprehend the hadiths together with a proper understanding of the background and the prelude of the hadiths. In the absence of these prerequisites, the mere translation of the hadiths is bound to lead to objections and misgivings. The repercussions of these differences have reached such proportions that people have split up into various sects grappling and contending with one another. The wudu’ of one group is considered invalid by the other while the salat of one group is considered void by the other, and so forth. In zakat, sawm, hajj and virtually every other act of worship [‘ibada] as well, there is inevitably some difference or other which has led to people debating with one another. 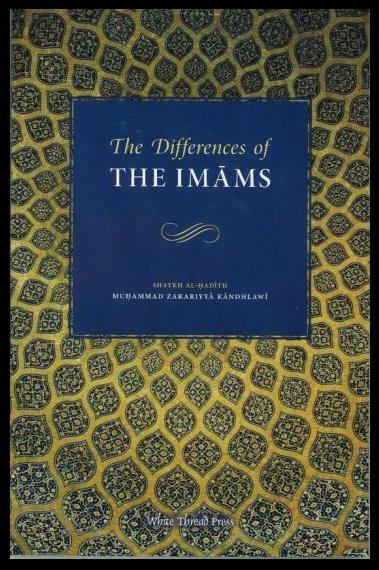 Therefore, it has become necessary to expose the basis of the differences (of opinion) found among the Imams. The reasons for these differences, dating back to the first epoch of Islam, will be expounded upon to demonstrate that the apparently contradictory texts of the hadiths leave no scope for doubting the Messenger of Allah (S), nor do they give anyone the right to cast aspersions on the Companions [sahaba], the Followers [tabi’in] or the Imams (may Allah have mercy on them). The fact is that all the Imams [mujtahidin] were leaders of the correct path and they encouraged and guided the masses toward the correct path as well. Any slanderous remark cast against them is a sure sign of the deprivation of Allah’s mercy. May Allah protect us. Amin. This piece just proves that the self-study of religion never shows any good result. I just wish people understand and stop trying to ‘research’ Islam on their own and start listening to the Aakabir in Islamic knowledge. They are destroying their own faith. This is an amazing blog, Mashallah. May Allah reward you. interesting piece, in respect to the blessings of the difference of the opinions. If you got any book answering to Salafiyyah Dawah please mail me.